We've been having awesome weather in NE Tennessee. It hasn't really been too hot yet and the humidity has held off. I know it is on its way, so I've really enjoyed being outside while it lasts. But the one thing I have really enjoyed lately is the awesomeness of locally grown strawberries. Oh. My. Wow. These strawberries from Scott Strawberry & Tomato Farm have been insanely wonderful. You can buy them at stands set up around the area or you can get them at our local grocery chain (Food City). I've done both. I have made lots of crazy good stuff with these beauties, including these Strawberry Whoopie Pies. I thought it would be great to put strawberry cream cheese as the filling of the whoopie pies, since I had some extra strawberries left. Um, hello? Double strawberry? Cream cheese? You can't go wrong with that. Preheat the oven to 350. Line two baking sheets with parchment paper or Silpat. Put the strawberries in a food processor and pulse until they are chopped but not pureed. Set them aside. In a bowl, sift together the flour, baking soda, and baking powder. Stir in the salt and set aside. Combine the brown sugar and oil in a large mixing bowl and mix well with a wooden spoon. Stir in the chopped strawberries and the buttermilk until just combined, then whisk in the egg. Fold in the flour mixture in two batches, making sure not to overmix the batter. Chill the batter for at least 30 minutes. Drop 18 large or 48 small scoops of batter, about 2 inches apart, onto the prepared baking sheets. Bake in the middle of the oven for 10-12 minutes for the large whoopies and 8-10 minutes for the mini whoopies, until the cakes are left with a slight impression when touched with a finger. Remove from the oven to a wire rack and let them cool completely. In a large mixing bowl, mix together cream cheese and butter. Add 4 cups of the powdered sugar and then the mashed strawberries. Add just a pinch of salt. Mix well. If it still seems to be a bit too soft, continue adding powdered sugar until you get the consistency that you like. I ended up using around 5 1/2 cups of powdered sugar. Spread a generous scoop of strawberry cream cheese filling on the flat surface of a cooled whoopie. Top with another whoopie to make a sandwich. If you like, dust with powdered sugar, and serve. You are not kidding on the REAL strawberries. So different than those you find year round. So much flavor and pure awesomeness! And double strawberries? Sold! I know. I usually like to dip strawberries in fruit dip, chocolate, or even sugar, but with these.....man, they are good all on their own. I hope I can bring you some before the season is completely over. I SO agree. Can't go wrong with strawberries + cream cheese! Love this combo. I love your new blog, Shan-Shan! Between you and "SoHowsItTaste," I am well supplied now with great recipes and places to eat. Congrats! Hey Shannon! LOVE the new blog design!! And these whoopie pies look delicious! Hope you are doing well!! Thanks Jenniffer!! Doing alright! Hope you and Chad are doing well too! Love the new blog!!! 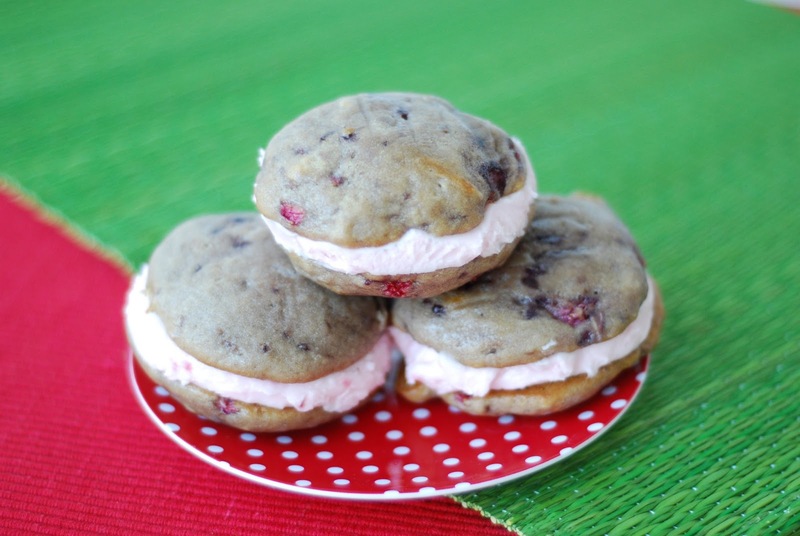 And these whoopie pies look SO amazing - want! Love strawberries! And these look fabulous!